Review by AllTheBestFights.com: 2017-12-02, some good exchanges in the second part of the fight but it is not enough to get three stars: Angel Acosta vs Juan Alejo gets two. Angel Acosta entered this fight with a pro boxing record of 16-1-0 (16 KOs=100%) and he is ranked as the No.13 light flyweight in the world. ‘Tito’ Acosta has already fought twice in 2017 beating Japhet Uutoni and losing to Kosei Tanaka (=Tanaka vs Acosta). His opponent, Juan Alejo, has a record of 24-4-1 (14 knockouts) and he entered as the No.27 in the same weight class. He lost to Donnie Nietes in 2015 (=Nietes vs Alejo) but since then he has collected four victories and one draw. 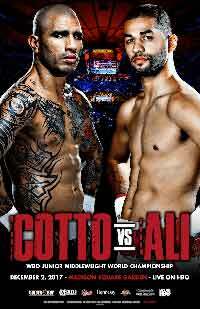 Acosta vs Alejo is valid for the vacant WBO World light flyweight title; undercard of Miguel Cotto vs Sadam Ali. Watch the video and rate this fight!